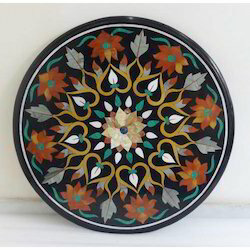 Our product range includes a wide range of marble micro mosaic inlay table, square inlay table top, square marble inlay table top, hotels marble inlaid table top and square marble inlay table tops. We are offering Marble Micro Mosaic Inlay Tables with gemstone inlay art work to our client. Stones are used in order to fabricate these tables and these could be used for decorating the interiors. 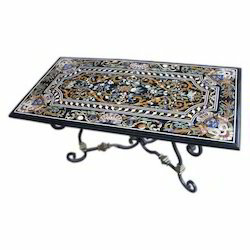 These Marble Micro Mosaic Inlay Tables are provided in different design, specification, model, colors and patterns. We charge reasonable rate with our buyers. This Marble Micro Mosaic Inlay Tables is available in various size and finishes with design of vibrant colors and at the most economical price. 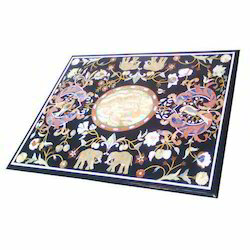 Bring home a piece of the Taj Mahal, Each of these Pietra Dura Marble Table Tops here is hand made and contains Marble Slabs Inlaid with Pure And Natural Semi Precious Stones like Malachite, Mother Of Pearl, Lapis Lazuli, Agate, Italian Stones, Jasper etc. This art of Marble Inlay (pacchikari or pietre dura ) has been passed from generations, right from the craftsmen who made the Taj Mahal. Today, their great-grandchildren are engaged in this activity, known to a select few, and in great demand all over the world. The Taj Mahal has been created in this style of workmanship which is unique and exclusive all over the world. These table tops can be used as Dining Tables, Coffee Tables, Conference Tables, Chess Boards, Reading Tables, Bar Tables. They can also be placed outdoors in the garden or porch. Sizes can be fabricated as per your needs. 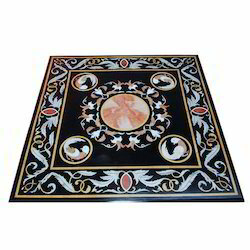 We have carved a niche as a leading manufacturer and supplier of Marble Inlaid Table Top for Hotels. Our provided table top is crafted at our ultra-modern manufacturing unit under the direction of experts keeping in pace with market trends. As well, this table top is well checked by our quality controllers on diverse parameters for delivering perfect range. Our valuable customers can avail this table top in committed time frame in numerous designs & sizes. Looking for Marble Inlaid Table Top for Hotels ?